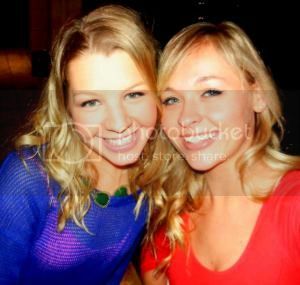 As you are all reading this, my precious little Fergie-Ferg is on a plane back to Italy. I'm not usually an emotional person but when it comes to my best friend living in a different country, I'm not really a happy camper. The hardest part is the actual day of departure -- I usually spend all day with a pit in my stomach, lump in my throat, and tears just hanging out in the backs of my eyes, sounds great right? After I know she is safe and sound back in Europe, the adjustment period begins. We have to get used to the fact that we aren't 20 minutes from each other anymore, and that there is a 6 hour time difference. You would think that after going through this process a handful of times already it would have gotten easier. But it most definitely hasn't. Everyone goes through ups and downs throughout their lives, all brought on by different events and circumstances. It's during the "down" times that we have to keep reminding ourselves of everything we are thankful for. We are so quick to forget of the things that make us smile, or memories of times that made us laugh so hard we had tears streaming down our cheeks. I decided that I had to have a way to remember the good times, for when I am feeling a little sad, and I need a small reminder of how great everything really is! I took a jar and began writing down memories and moments that make me smile. 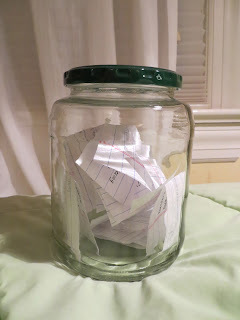 I put each on it's own piece of paper, folded them up and popped them into the jar. I try to add a couple new ones each week. Then, when I'm feeling a little blue, I just reach into the jar, pull out a couple of my happy thoughts and am quickly reminded of all things that are good. Maybe some of you will think this is silly, which is fine! But I think that every once in a while it is important to remind yourself of all you have to be thankful for.